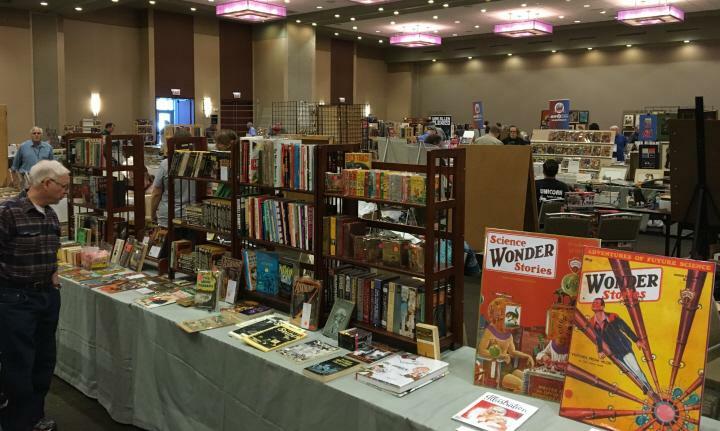 My favorite Chicagoland convention, by a pretty wide margin, is Windy City Pulp and Paper. 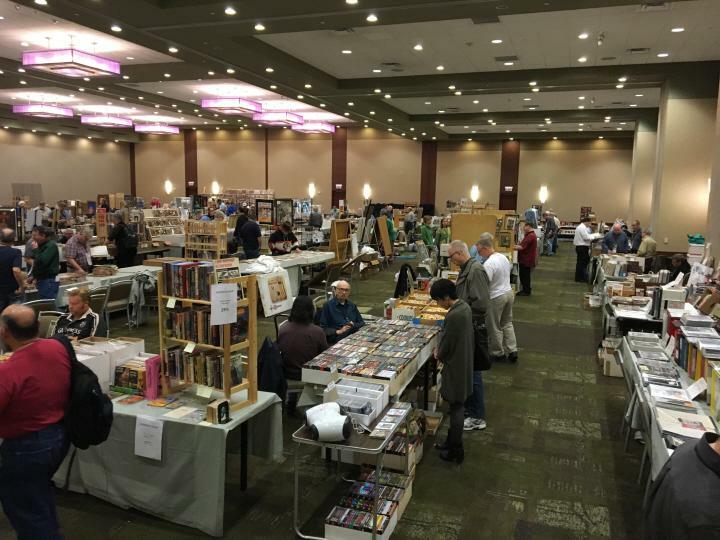 It’s organized by Doug Ellis and a team of volunteers, and this year it took place from April 22-24 in Lombard, Illinois, its home for the last decade or so. It’s a little strange that Windy City has bubbled to the top of my list. I entertain myself in numerous ways at conventions, but I especially enjoy a robust reading program, lively programming and panels, and late-night conversations at parties. Windy City has none of that. Sure, they have their Sunday New Pulp reading series, and the Friday night auction, and those are fun. 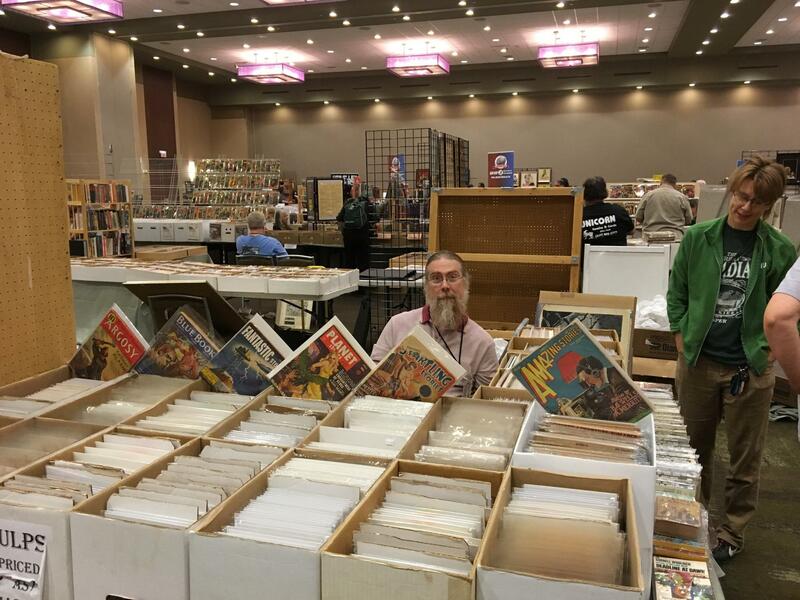 But at heart, Windy City is mostly just a giant Dealer’s Room. 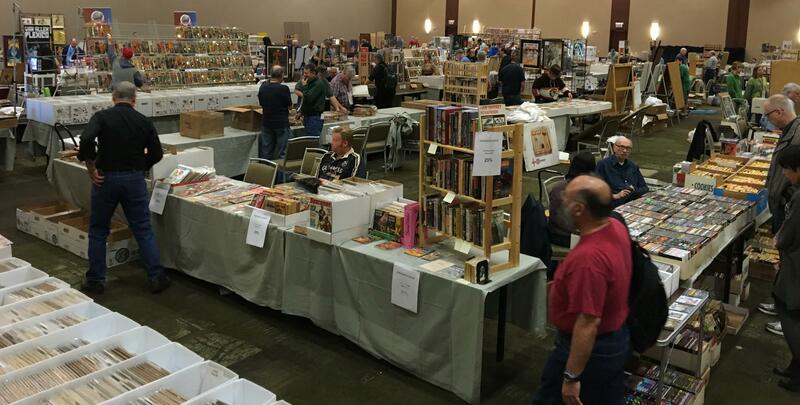 But what a Dealer’s Room! 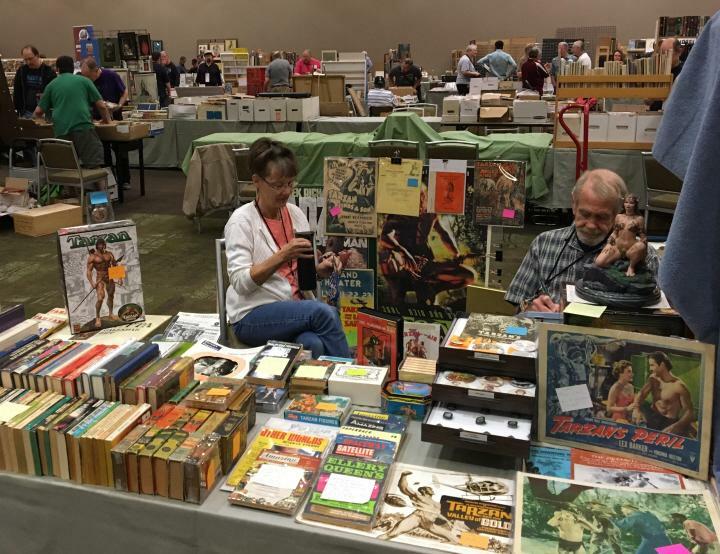 Dozens and dozens of dealers from all over the country packed into the ballroom of the Westin Hotel, selling pulps, vintage paperbacks, DVDs, artwork, comics, rare books, new books, small press publications, posters, and so much more. 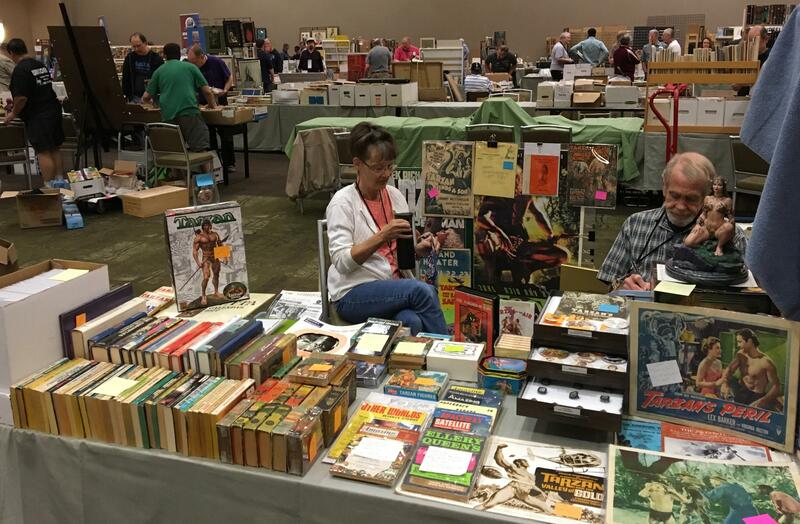 It’s the kind of Dealer’s Room you can get lost in for days, and for a lifetime pulp and book collector like me, it’s paradise. Windy City has been going strong since 2001. I don’t remember exactly when I started attending, but it was well over a decade ago. I got my first booth as a seller shortly after we launched Black Gate magazine in 2001. 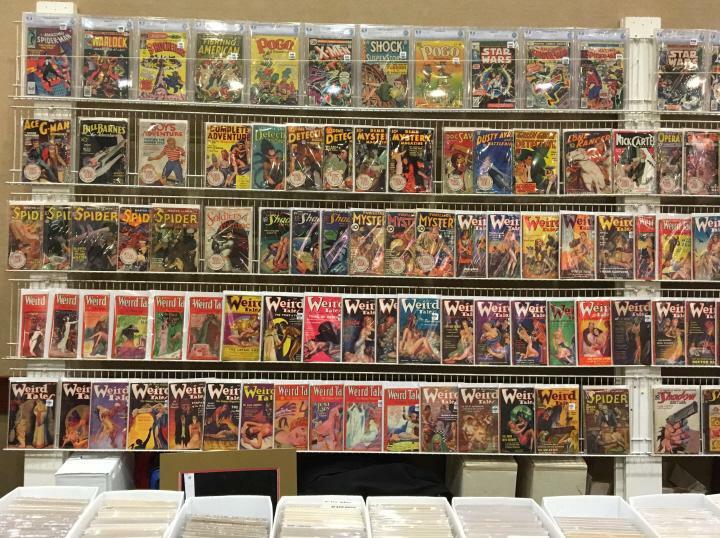 I proudly set up a display with the first 2-3 issues and, just so that my booth wouldn’t look empty, brought along a bunch of duplicates from my book collection to sell as well. 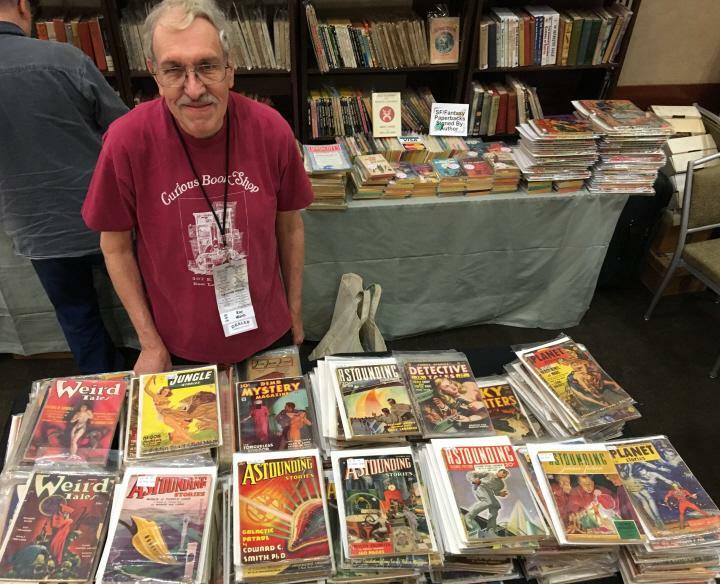 Turns out that a modern fantasy magazine is a tough sell to the pulp-crazy attendees of Windy City. Not so the vintage paperbacks, which sold briskly. 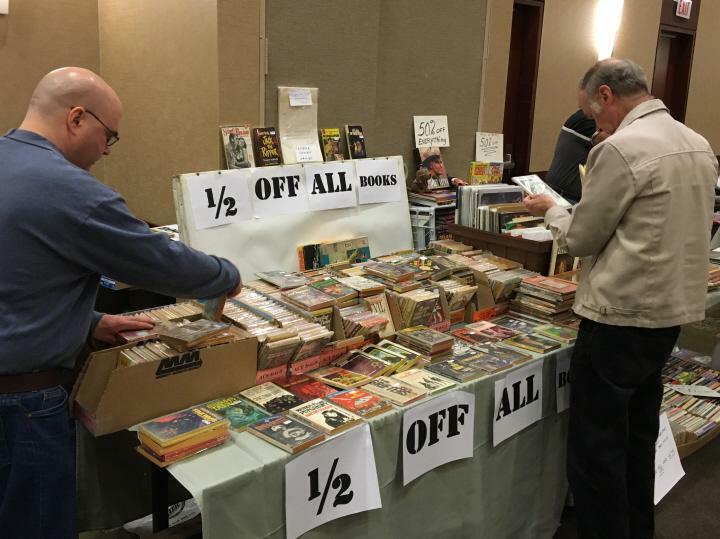 In fact, by the last day of the convention, most of the magazines I’d brought remained unsold, but I was running dangerously low on paperbacks. There’s much more to selling than these two simple rules, of course. But I never forgot them, and they served me extraordinarily well over the next 15 years — and not just while selling books. I haven’t had a booth at Windy City in years, since before the print version of Black Gate died. But this summer, with leftover advance proofs and unread review copies accumulating rapidly on the floor of my library, and the storage space in my attic looking perilously overcrowded, I decided the time was right. 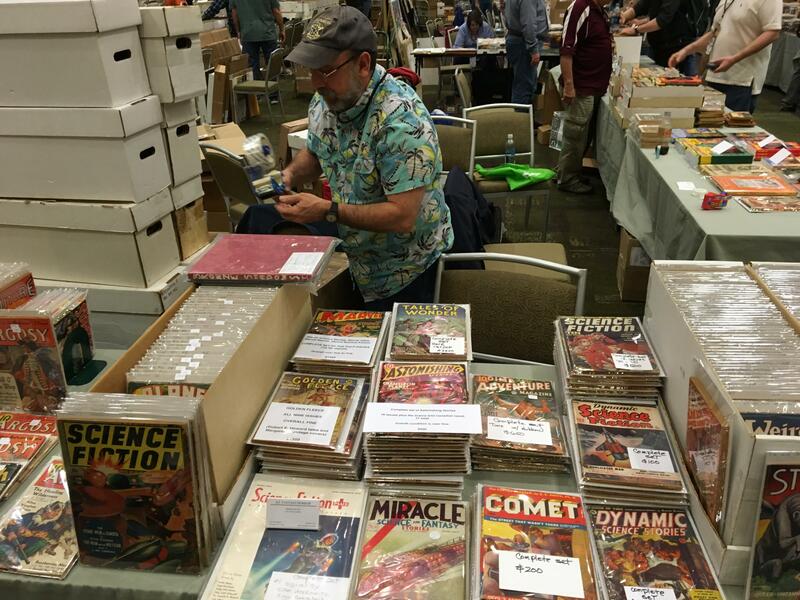 I contacted my friend Jason Waltz, publisher of Rogue Blades Entertainment, to see if he’d be interested in sharing some space this year — and I was delighted to discover he was. 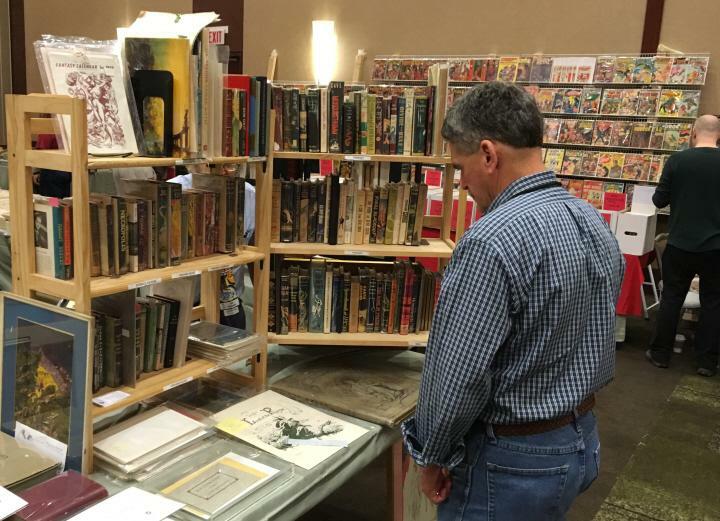 He had a small amount of stock of early RBE anthologies he was trying to move, as well as assorted odds and ends, and it was a short drive from Milwaukee to Lombard for him. 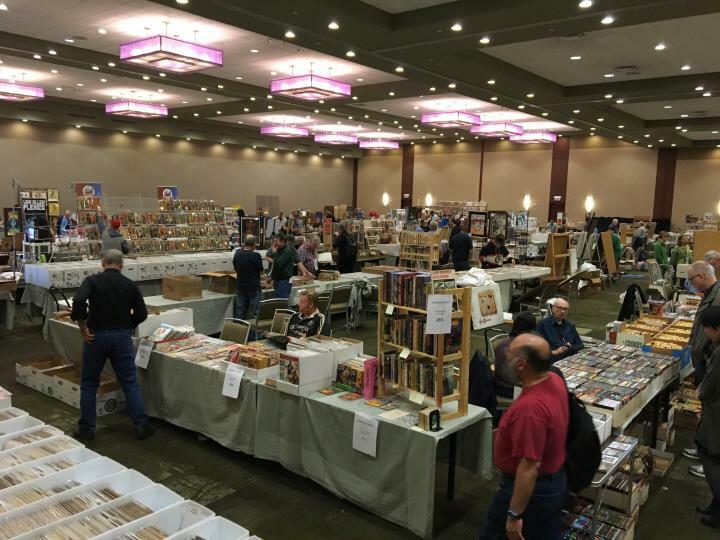 I reached out to Doug Ellis to purchase two tables, and began the slow process of sorting and pricing several hundred books in preparation for stocking two full tables in the heart of the best Dealer’s Room in the industry. As I did, I was guided by the experience of my friends Arin Komins and Rich Warren, who made the tough decision to shut down their book business, Starfarer’s Despatch, last fall. I’ve made many a happy purchase from Arin and Rich at conventions over the years, and was sad to see the business wind down, but I understand the realities of bookselling these days. 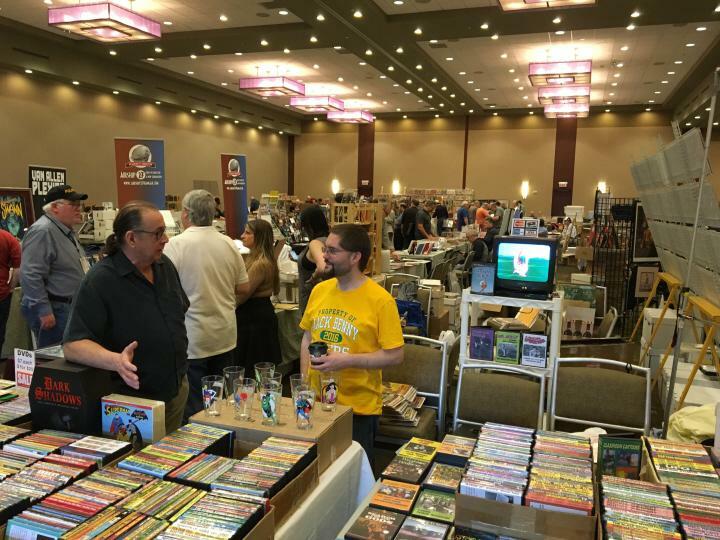 I watched Arin and Rich conduct a very successful going-out-of business sale in the Dealer’s Room at Windycon last year. They put up big signs announcing the sale, and marked everything down by 50%. I wandered by their booth several times, hoping to pick up some bargains, but it was so crowded I always gave up. Boy, that’s the way to move a lot of books, I thought. Mark down everything in the booth, and turn it into an event. That’s exactly what I decided to do. I priced all of my stock — unread review copies and advance proofs from the last 5-6 years — between four and six bucks each. And then I made up a bunch of signs announcing that everything on the table was 50% off. That meant I was selling hundreds of brand new SF and fantasy hardcovers for $2-$3 each. You never sell as much as you hope to at these shows, but I was relatively confident that I ‘d be bringing back a much lighter load than I arrived with. Of course, it didn’t turn out that way. I should have remembered the lesson from my very first first Windy City… price stock too cheap, and it gets ignored. My first setback came three weeks before the show. I was starting a new job in downtown Chicago on April 11, barely ten days before Windy City opened its doors. A week before my start date, my new boss contacted me. There was a banking trade show in San Antonio, April 20-22, and it would be a great chance to start making contacts in my new role. Would I be interested in attending? Of course I would… but the schedule meant I couldn’t get back to Chicago in time to man my booth on Friday at Windy City. 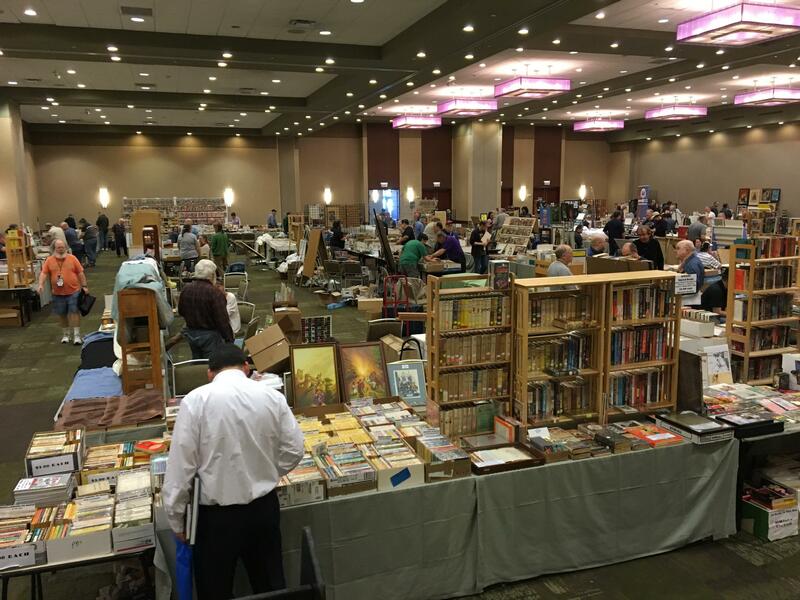 I didn’t mind a day of missed sales (much)… but a booth at Windy City is a hot ticket. There was a wait list for tables… how would it look if I didn’t even bother showing up on Friday? Hardly a very auspicious way to return to the finest Dealer’s Room in the business. I made some calls, desperately trying to find someone interested in a free table at Windy City for a day. 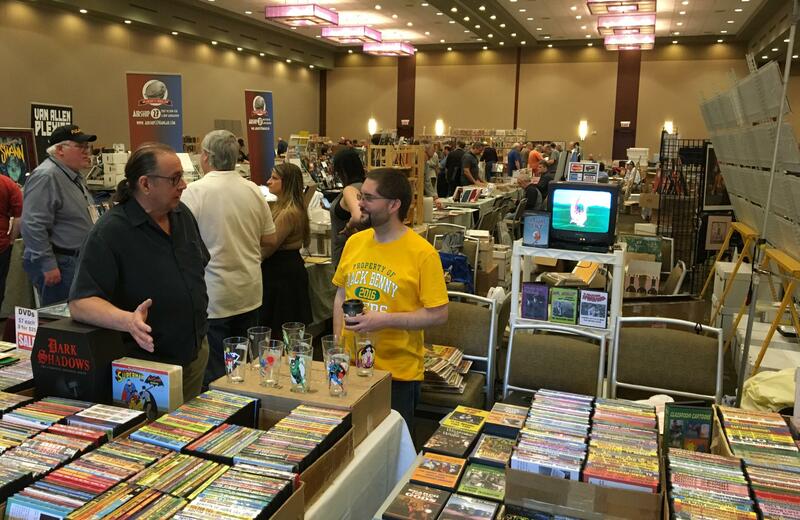 As luck would have it, Jason Waltz was generous enough to agree to man one table all on his own, and Doug Ellis found another vendor to fill the second table on very short notice. So my way was clear to visit San Antonio for the conference. Before I left I bought a brand new smartphone, an iPhone 6s, and I quickly became enamored with it. Web surfing is smooth and painless and, unlike my previous phone, an iPhone 4, the screen is big enough — and the touch-screen sensitive enough — to allow me to write, edit and post short articles at Black Gate. An era of unprecedented productivity beckons! My flight from Chicago to San Antonio was a disaster, however. I routinely aim to arrive at O’Hare 90 minutes before my flight departs, to allow plenty of time to get to the gate. The morning of my flight traffic was light, and I made the airport in plenty of time. I took the tram from long-term parking to the United terminal, and ran smack dab into the atrocious security line. It was so long the United agents wouldn’t let me enter it, sending me down to the next one… which wasn’t any better. I spent 70 minutes in the line, then sprinted for my gate like OJ in that old Hertz ad. Fortunately, United put me on standby on their next flight to San Antonio less than three hours later, and I arrived just in time to make the conference. When I mentioned to my father that I was visiting San Antonio, he told me about his own visit in the 80s, when he was an electrical engineer with the Canadian Armed Forces, and that the city’s riverwalk was one of the most amazing things he’d ever seen. He made me promise to make the time to explore it. I’m glad he did, because it’s truly unique, an architectural marvel that winds through the very heart of the city. At night it’s like something out of a fantasy novel, lit up with colorful lights and crowded with people, restaurants, benches, and statues. 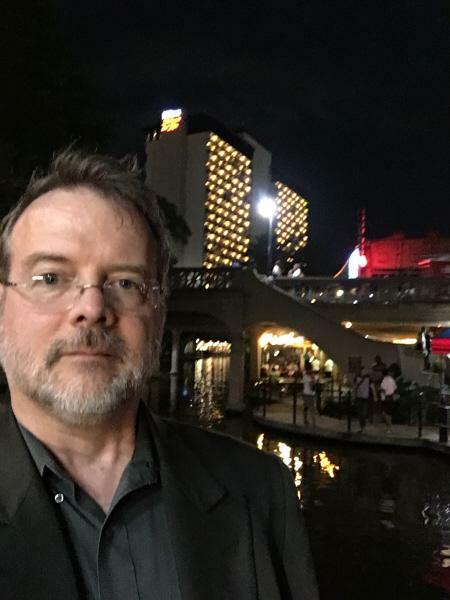 I took a selfie on the riverwalk with my new phone and posted it to Facebook, along with a bunch of pics of the riverwalk at night. 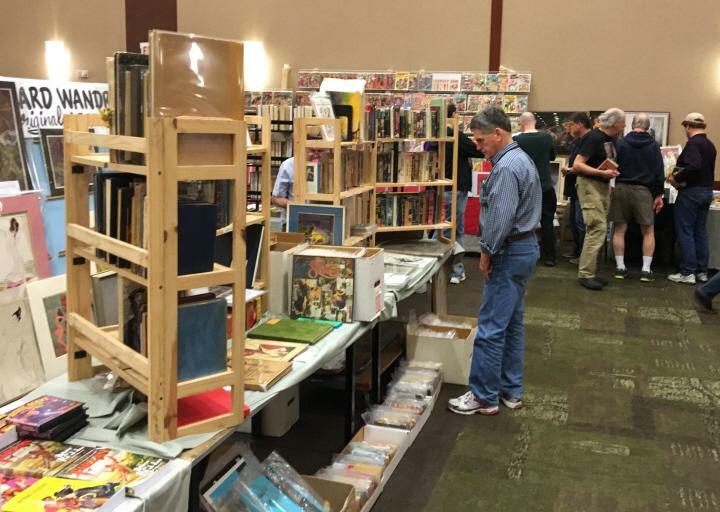 What am I doing in San Antonio during Windy City Pulp & Paper? My return flight to Chicago on Friday was much less eventful. I arrived at Windy City after the Dealer’s Room had closed for the day — but just in time to join some friends for dinner. BG blogger Barbara Barrett had made the long trip to Chicago, and she invited me to join her, Bill “Indy” Cavalier, John DeWalt, and their friends Friday night, and I was very happy to do so. Dinner was marvelous, and it was great to hear all the latest goings-on in REH and pulp fandom. A day of sales at the show wasn’t the only thing I missed by visiting San Antonio, however. Doug Ellis and his wife Deborah usually have a small party the night before the show opens for vendors and volunteers, and I was unable to attend. Barbara did, however, and she had the presence of mind to do something I’ve never done in all my visits to Doug’s house: take photos of Doug’s gorgeous art and pulp collection. I’ve been collecting pulps and magazines my entire life, and I’m proud of my collection, but it pales next to Doug’s. 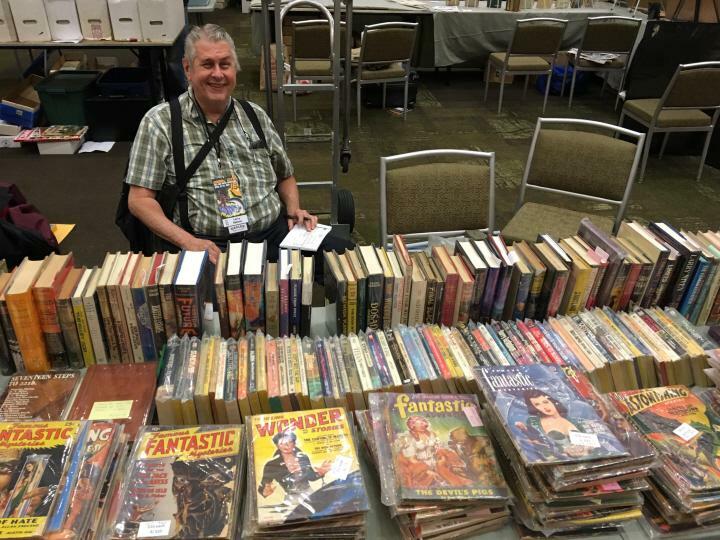 Not only does Doug have more pulps and magazines than anyone I’ve ever met — including virtually complete collections of Amazing, Weird Tales, and many others — but they are beautifully sorted and displayed (whereas mine are in unruly piles in the basement). 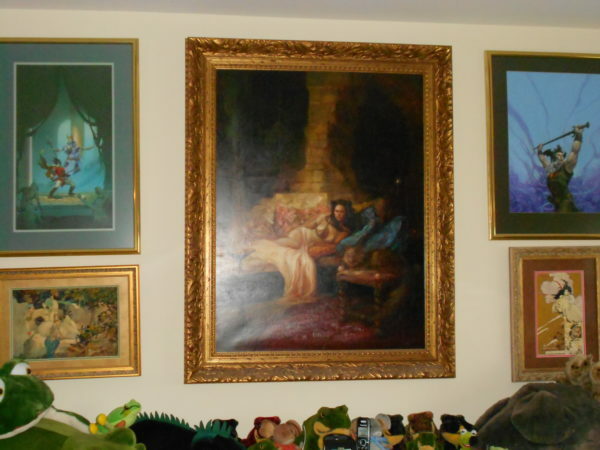 But the most impressive part of Doug and Deborah’s collection is their amazing assortment of original artwork, gorgeously displayed all around the house. They have paintings by Michael Whelan, Frank R. Paul, Kelly Freas, Margaret Brundage, Don Maitz, and many, many more. Barbara posted an assortment of pictures of Doug’s collection at Two Gun Raconteur earlier this week. Check them out here. Saturday was my first actual day at the convention. 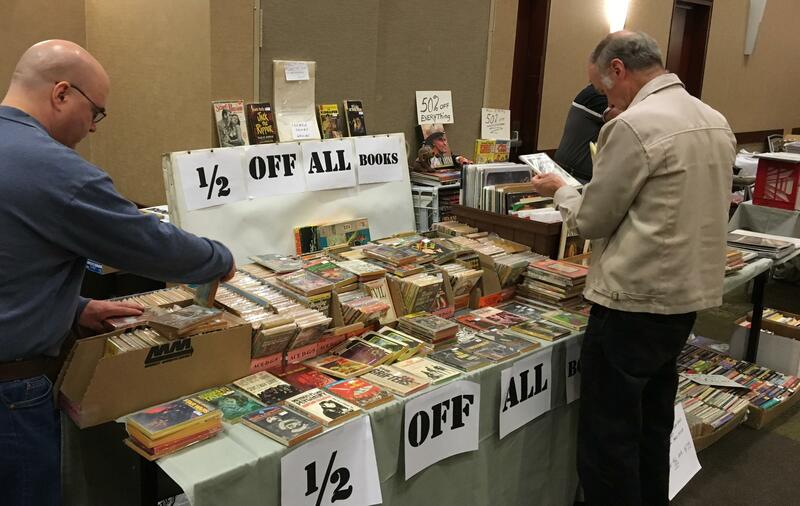 I got there early so I could set up the tables, piling them high with hardcovers, vintage paperbacks, and Black Gate back issues… everything priced at 50% off. In keeping with the Starfarer’s Despatch model, I printed out a bunch of signs announcing the sale, and taped them all over the booth. Barbara Barrett snapped a pic of Jason and me in the overcrowded booth, shortly after the show opened. That’s it above (click for a bigger version). 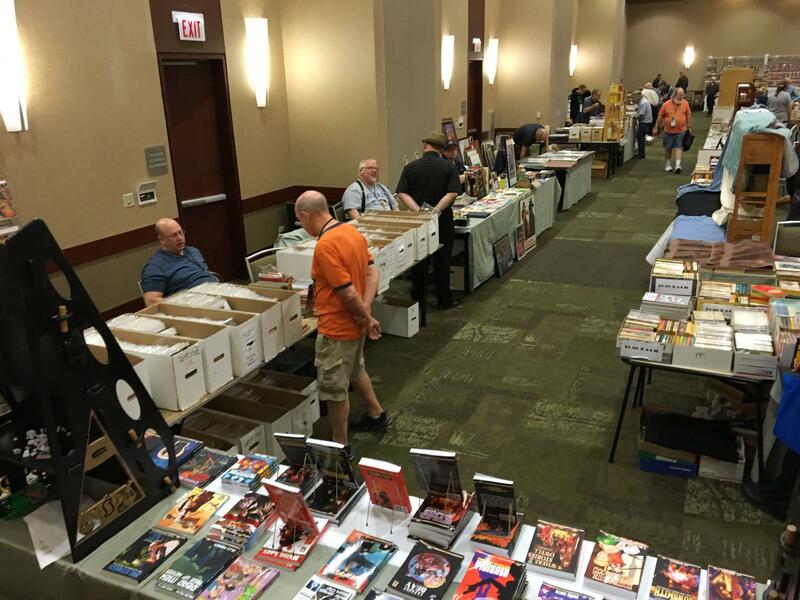 Having forgotten all the lessons from that first Windy City all those years ago, I foolishly piled boxes overflowing with paperbacks on the floor in front of the booth. We’ve written reports on Windy City Pulp and Paper sporadically over the years. Here are some of our earlier efforts. Check out the website for the 2017 show here. I’ll cover more of the details of the last two days of Windy City Pulp & Paper — and include a lot more pictures — in Part II of this report. 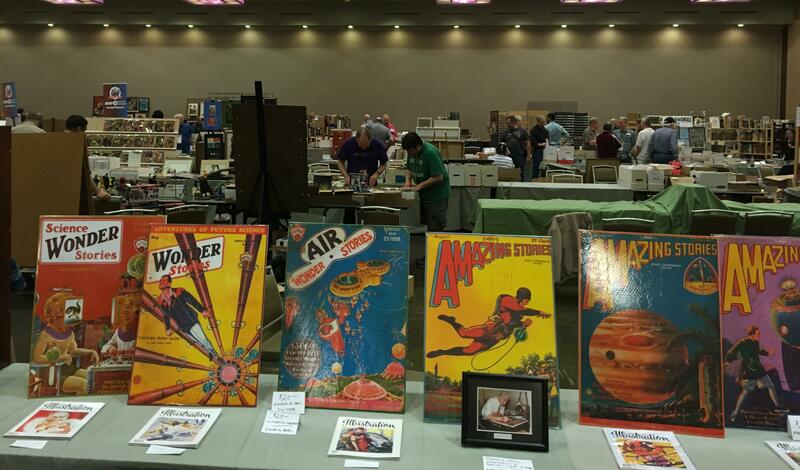 To tide you over, here’s a few more pictures from around the Dealer’s Room. Wow. It looks like a veritable heaven for balding, middle-aged white guys. Would that I could be there to make one more! Would love to attend one of these some year before I get much older but pretty certain I would run thru my limited cash flow in an hour easily. 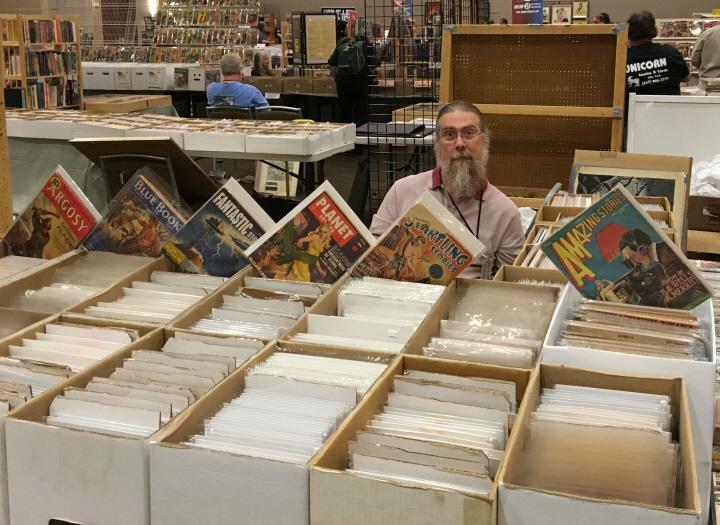 I still have happy memories of Pulpcon 1977 in Akron Ohio where I met and I think I managed not to annoy Walter Gibson with too much fanboying. Leigh Brackett was there and I looked at her but not ever having read anything by her did not approach. Will Murray had just released his Duende #2 and found him charming. 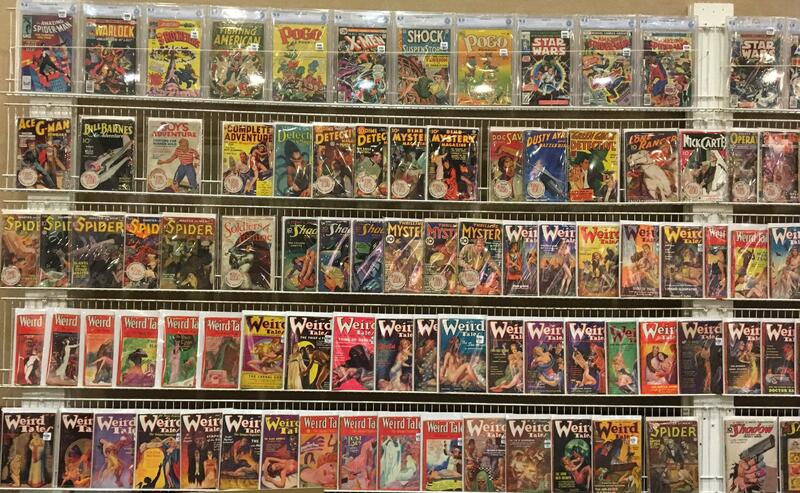 I was 26 back then and new to the pulps which take a backseat to my comics collecting which is why I only have about 100 pulps. I go for title/character. Great photos and saw at least one Planet Stories I own in one shot. I see some fabulous books and magazines in those photos! Great post. Look forward to seeing the next one. 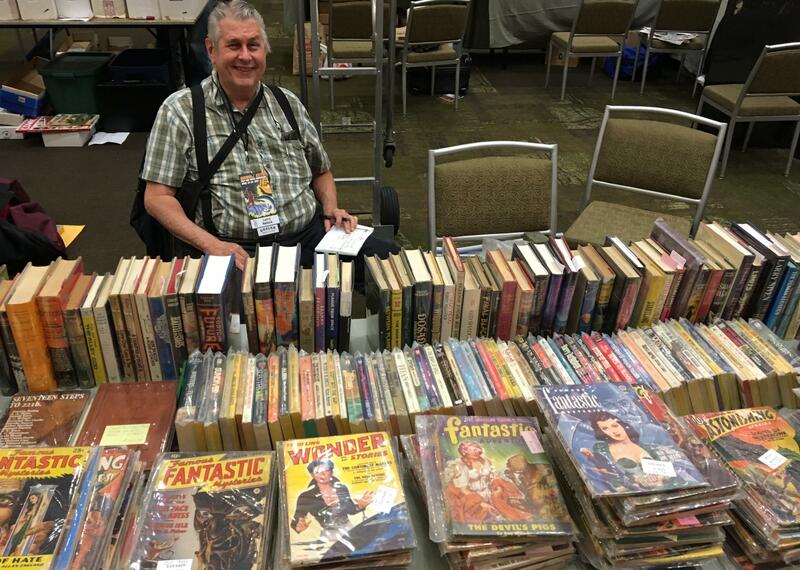 I bought some Galaxy and Unknown magazines at World Fantasy from vendors who routinely attend Windy City Pulp & Paper Con. I really want to try to make it sometime. It’s close enough to drive to, which means I don’t need to worry about coming back with stacks of old magazines. Your observations on underpricing make perfect sense. For similar reasons, I decided to adopt, rather than try to undercut, the pricing structure Tor.com uses for novellas when I priced The Imlen Brat. As usual, John, you were the consummate host and I enjoyed the weekend with you (despite my fatigue!). I did miss your trademark tweed jacket however. And yes, San Antonio’s Riverwalk is delightful. WFC ’17 will be held there, and I shall be in attendance. Always lovely to catch you in the Hucksters Room! The Riverwalk in San Antonio is spectacular. I remember a riverside BBQ dinner on a gorgeous evening, followed by a river cruise. All part of a quick road trip from Austin (before World Horror Con) and it was totally worth the drive! 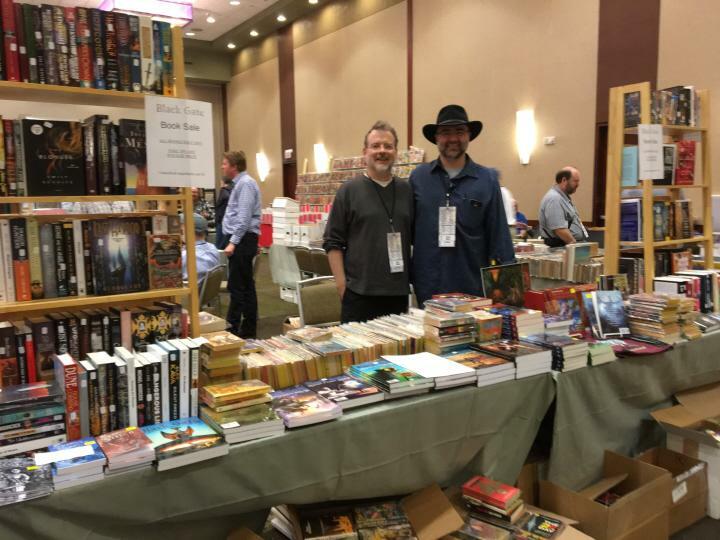 Jason means the 2017 World Fantasy Convention, THE big convention for fantasy fans. Which I forgot was in San Antonio next year… […rushes off the check…] I’ll be darned. It IS in San Antonio next year! Apparently San Antonio is about 355 km from Cross Plains. So anyone going next year may as well budget an extra day to swing by REH’s home town. Once I would have had to padlock my checkbook not to overreach my budget at someplace like Windy City. I’m especially attracted to the original artwork (expensive!) and the ’50s digest issues of Astounding Science Fiction. 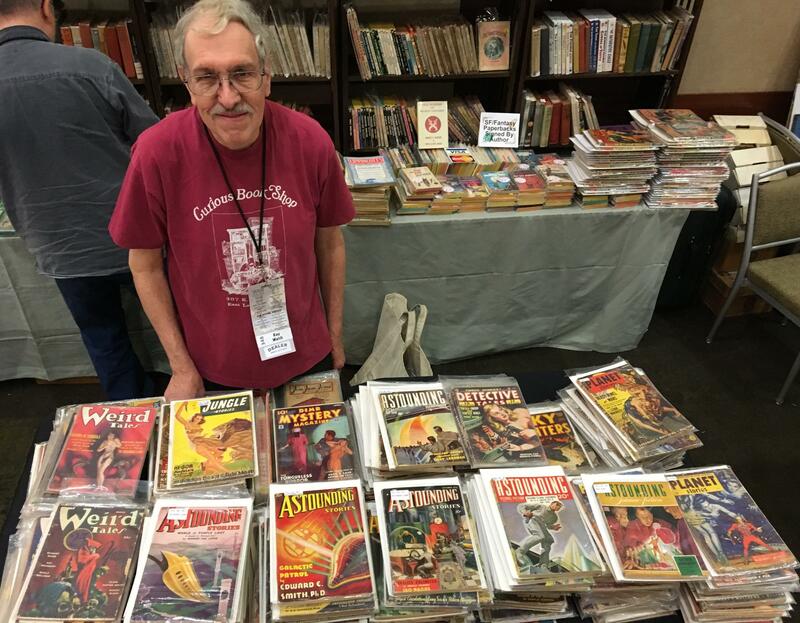 But I find, at age 70, that I’m more interested, as far as pulps, comics, books go, in reading them than buying and owning and having them on shelves. Also, living on the west coast (Portland) it’s too far to drive and I don’t fly. So I’ll content myself with reading your reports and enjoying your photos. Note that Walker Martin usually does a nice report on Windy City as well. You and me both. I made a conscious decision two decades ago that I was NOT going to collect art…. it was a money hole that could swallow all my available funds if I let it. There are times when I regret that decision, and usually they’re at Windy City. > Note that Walker Martin usually does a nice report on Windy City as well.